Online advertising has changed a lot from traditional advertising to the smart and performance based advertising system. Earlier Google AdWords was one of the just few advertising networks where people had to advertise their products and services. But now we have thousands of Google AdWords alternatives who are doing some great job in the advertising industry. Advertising industries are now moving to RTB system and moreover performance-based system for better ROI. Again in the advertisement, it has always been a debatable topic – Desktop ads vs Mobile ads. Some say desktop ads provide better conversion to them while other agrees for mobile ads. If you will look into the forecast and trend in the US market by eMarketer, you will find companies are now more focusing on mobile ads. 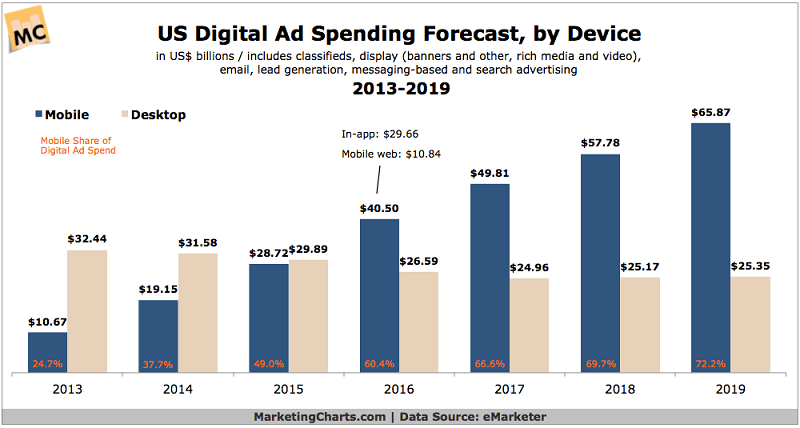 Even the forecast is, by 2019 the mobile advertisement will be 2.5 times to the desktop ad expenses. Please note this graph shows the expenses those will be done on the ads. Companies like BitterStrawberry and other performance based mobile advertising network has made this journey even more beautiful. They are working hard to provide the advertisers best benefit they can get from their campaigns. Today, we will be talking about BitterStrawberry mobile ad network in this BitterStrawberry review. We will also see how this is helping the advertisers and publishers to get the maximum out of their money invested. 1.2.2 How to join BitterStrawberry as an Advertiser? BitterStrawberry is a leading mobile advertising network serving ads worldwide. You can find over 12k offers every time which you can promote anytime. They work on CPC, CPI, CPL, and Revenue Share model. 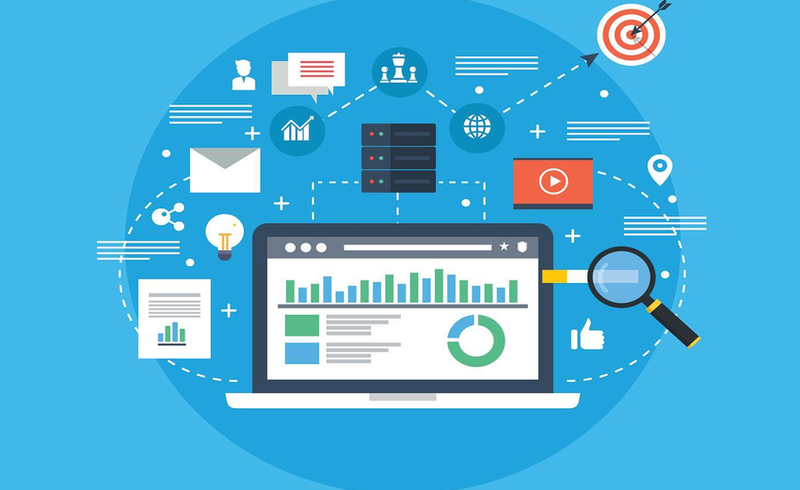 BitterStrawberry in-house technology platform enables both advertisers and publishers to utilize the campaigns effectively and get the maximum ROI on their campaigns. You can run campaigns based on the device, OS, country, connection, carrier and even time. BitterStrawberry’s unique targeting system offers both advertisers and publishers optimize their campaigns. 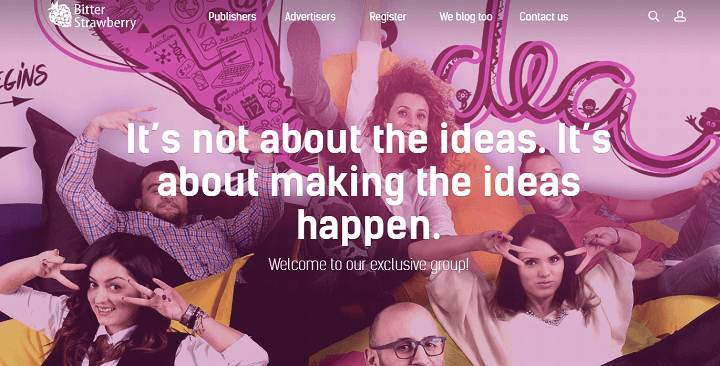 To join BitterStrawberry ad network as a publisher, there are no special requirements and anyone can join it. They accept all niche websites and campaigns including adult, so, all publishers and advertisers can monetize and advertise on it. Here are some of the attractive features of the BitterStrawberry ad network which you can avail. It is a global ad network and advertisers and publishers from all the geography can join the network and start with their ad campaigns. Using the proprietary ad detection tool, they are able to implement daily above 500 mobile offers, which are tested with in-house traffic, benchmarked and set live for you to choose from. Smart links come in a variety of forms, tailored to each affiliate’s traffic type, user demographics, campaign benchmarks & more. The tool doesn’t only allows you to target offers that match your every visitor with tailored ads to meet the criteria of your user (Country, Connection, Carrier/WiFi, Device, OS, Browser, Day/Night Parting & more), but also can be used as a fallback/remnant solution for the campaigns you run singularly and backfire, reach capping or you have un-targeted bulk traffic. 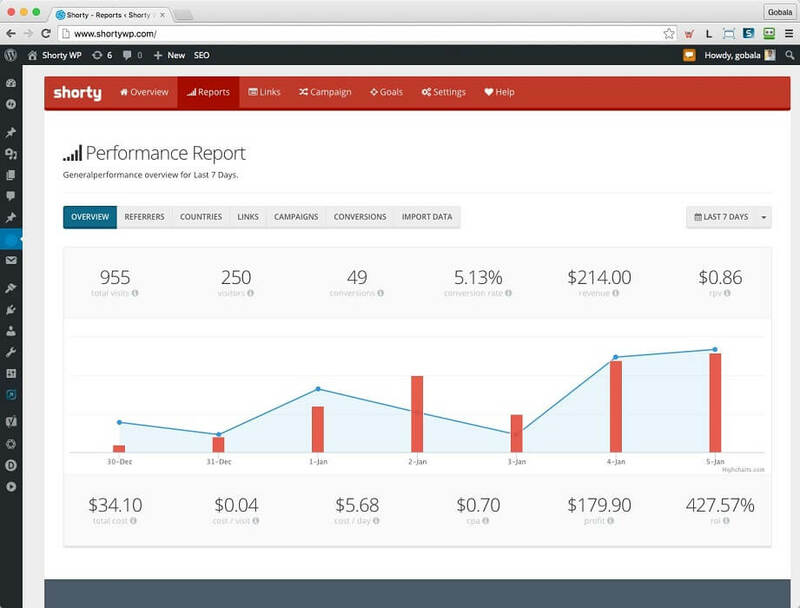 You need not use any 3rd party tool with the ad network to track the ROI or any other reports like Analytics. You will find all such tools in the BitterStrawberry dashboard. You will have free and unfettered access to offers, live reporting, advanced targeting options and A/B testing. You will be able to choose the offers from 6 continents & 250+ markets. Every time more than 9000 campaigns are live from which you can select the offers. With over 500 Million impressions and 4.6 Million leads generated per month, BitterStrawberry is a leading ad network worldwide. 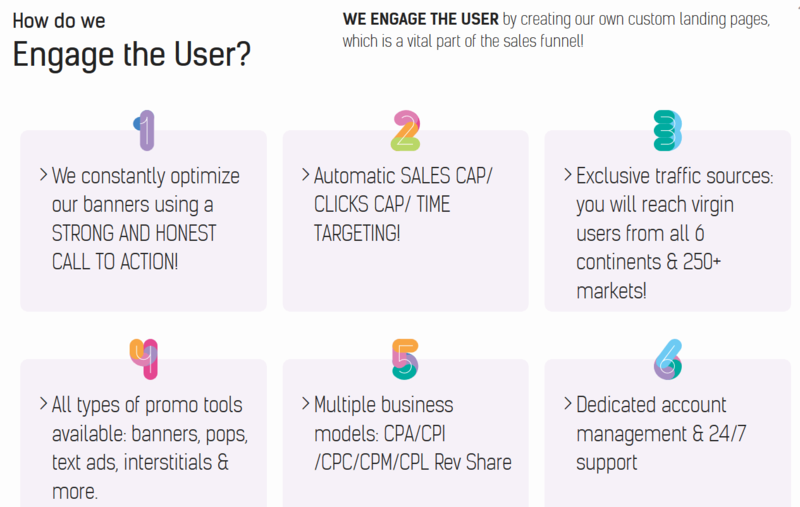 You will have accessibility to sales cap and click cap for better performance evaluation. No matter you are a big publisher or advertiser or the one who has just started, BitterStrawberry is for all of us. You can join the network, setup the campaigns and start generating the revenue. And this applies to both advertisers and publishers. It is their hard work, reliability, and acceptance which has made them the leading ad network. As stated above, BitterStrawberry is a performance based advertising network which provides lots of features to their advertisers. They ensure only targeted traffic is being sent to your website which will ensure the high conversion rate. You can estimate this fact from the figure where BitterStrawberry provides 500 million+ visitors and 460 million+ leads. You can optimize and target the ads based on Country, Operator, Connection, Device, Operating System, and Browser. How to join BitterStrawberry as an Advertiser? Just click on the join now link and you will be redirected to their advertiser registration page where you will have to fill certain basic fields. Most of the fields will be related to your demographic and personal details. While at the end, you may have to answer your target ad and audiences for better understanding. Once you have submitted the details, you will receive an email for verification and then you can proceed. BitterStrawberry equally provides great opportunities for the publishers as well and ensures they are getting the proper value to their traffic. 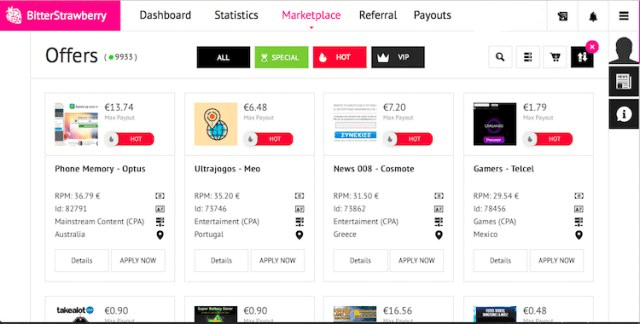 There are thousands of global offers running live at BitterStrawberry and you can select depending on your traffic and audiences. You no longer have to send all your traffic to BitterStrawberry. They will only take the users that can be converted, at a much higher rate. This will help you to sell your remaining traffic to some other advertisers or ad networks as well. This is the reason why BitterStrawberry has a much higher conversion rate. You can define special traffic routes by yourself on your site. BitterStrawberry scan your traffic, monetize the best parts of it at higher rates and resell the remainder to a third party platform; all based on your routing preferences. This will help you to get much from the limited traffic and rest of the resources can be reutilized. Joining the BitterStrawberry network as a publisher is an easy task and won’t take more than a couple of minutes. Just follow the link and fill the required details which will be your personal, demographic, and sites related details. Once done, you will receive an email with the verification link and the details. Verify your account and you will be landed on your BitterStrawberry dashboard. This is the dashboard from where you will be creating campaigns, tracking it, reporting and will do all the other stuff. BitterStrawberry direct offer marketplace comes up with thousands of exciting and highly paid offers every day. You can select the one which you find will be profitable for you and can start promoting it. There are various filtration options available based on which you can filter the offers like GEO, Category, OS, Payout Type, Billing Flow etc. You can apply for the campaigns which you find suitable for you and upon approval, you can start promoting it. SmartLink® is roundups of campaigns where you can send traffic altogether to and start generating the revenue. BitterStrawberry SmartLink is quite efficient compared to many other ad networks and optimize for over 95% better performance. You can also earn from the referral commission. Let’s say you have referred someone to join BitterStrawberry publisher network and that person has started earning. Then you will get 10% of what he/she will earn. The payment system of BitterStrawberry is very exciting. They work on just NET5 and few others payment basis where you will get paid Net 5, weekly, bi-weekly and monthly basis. Different campaigns follow different payment cycle but you won’t have to wait for so long. 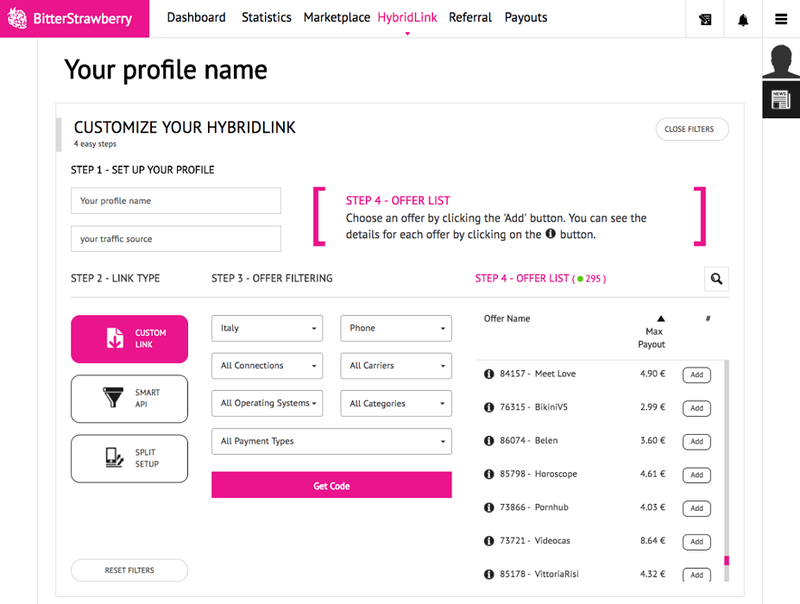 BitterStarwberry just launched a new revolutionary tool for publishers, The HybridLink®. This is an ultimate tool for all the publishers. The company has introduced this technology to cope with the fake traffic and leads. The HybridLink link allows the publishers to promote multiple offers, control the monetization stuff, and scale the campaigns for better ROI with just a button click. It is a tool developed by BitterStarwberry that works with a single URL that covers all geographic location that you are targeting, rotating through a mix of offers that you choose, out of the 12.000 most profitable offers on the market. You don’t have to pay a single penny to use the HybridLink and will be free forever. Just set it up once and then you will have all the offers you want to promote at one place, their stats and all the stuff related to it at a single place. This also doesn’t require any third party toll. Once you’re handy with this tool, you will be able to save a lot of time for other work. Once you will start any campaign, the stats will be updated every 10 minutes and so you can monitor it in real-time. This way you can take decisions quickly. Setting up the HybridLink for your account is pretty simple and you can easily do it from your dashboard. Still, if you need any help, you can reach out to their 24×7 support which is available in many languages including English, Spanish, Russian, Romanian, Turkish, Italian. This was all about BitterStrawberry review. If you are also looking your mobile traffic with one of the highest paying ad networks, you should try BitterStrawberry publisher network for sure. If you are an advertiser and looking to promote your product or service, BitterStrawberry can be your ideal destination. This is the fact that their traffic converts the best. Hope this BitterStrawberry review will help you to select the ad network wisely. Do share your reviews, if you have ever used BitterStrawberry ad network. BitterStrawBerry is a leading performance based mobile advertising network for advertisers and publishers. They have the best convertible traffic which generates the sales. You can join and get approval instantly to run the campaigns.